“They like me, they like me not”; who likes you, and why it really matters. Note: This is an excerpt from our 2013 Social Loyalty Report. You can download the full report here. Since the introduction of Facebook Pages in 2007, marketers have bent over backwards trying to estimate the value of getting users to interact with a brand on social network platforms – not just Facebook, but Twitter, LinkedIn and more recent start-ups like Instagram and Pinterest. The traditional focus of these research attempts has been to estimate the monetary equivalent of a Facebook like. The methodology is spurious at best: Marketers tend to measure the impact of a like by surveying the average amount spent by someone who “likes” a brand on Facebook versus “non-liker”. Fig.1 shows the difference in estimated like values by six research firms. 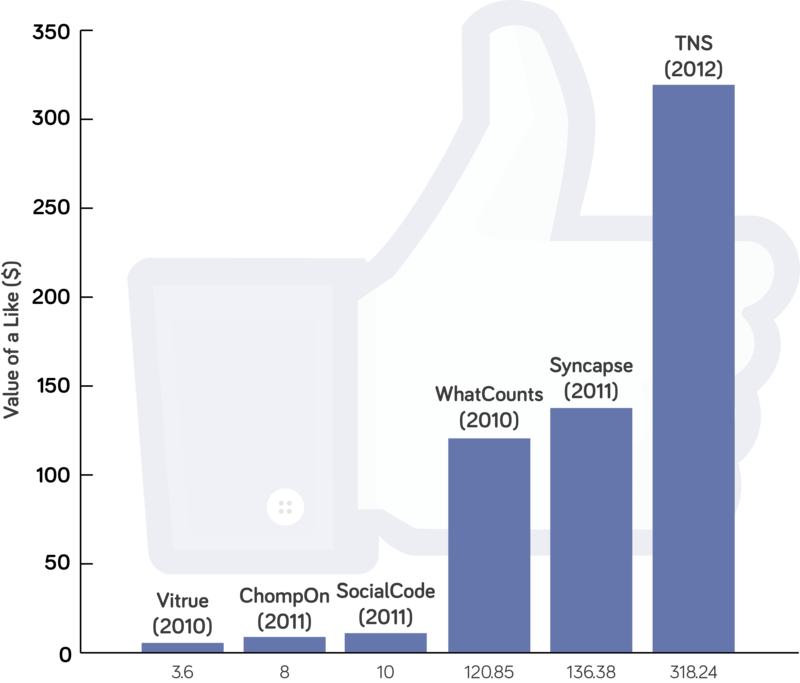 Not only is the variance in estimates immediately obvious, we can find that as of November 2012, up to 9 out of 10 blog posts and news articles refer to these same six studies when discussing the topic of the monetary value of social media, with the Vitrue and Syncapse studies alone accounting for 6 out of 10. Clearly, the money value of a like is more difficult to estimate than extrapolating numbers from a survey. The reasons why users initially like brands may give some more insight into their subsequent interaction on social platforms. 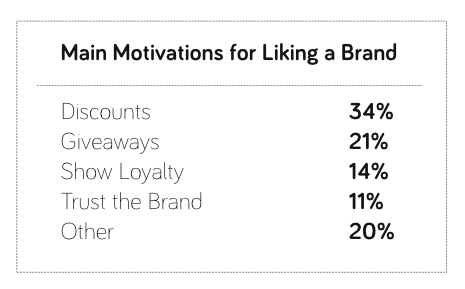 A recent study showed that for 55% of users who like a brand the biggest motivator is receiving promotional discounts or giveaways, while for another 25% the biggest motivator is showing brand loyalty and trust. Motivations such as liking a brand because a friend recommended it, or liking an unknown brand to acquire more information about it trail far behind. They decide to interact with a brand mostly to receive some form of discount on a future purchase. Liking a brand does not convert a consumer from casual to loyal – rather it is the transition from a casual to a loyal consumer that induces the liking of the brand. This seemingly throws a wrench into our intentions to monetize the social interaction: If the like has no significant impact on the user’s decision to purchase the product, what can the value of getting a customer to like the brand possibly be? It’s the ability to identify not how many loyal consumers you have (via the number of your likes), but rather who those consumers are. Facebook has only recently started to provide firms with the ability to engage in a certain degree of data mining in order to create targeted advertising campaigns. In the second part of our report we analyse how the information gathered from a pool of users who like a brand can be translated into targeted marketing. You can download our complete 2013 report here. Syncapse. (2010). The Value of a Facebook Fan: An Empirical Review. Syncapse. ChompOn. (2011). What is the Value of a Social Action in Online Commerce? ChompOn. TNS Digital Life. (2012). Putting a value on a Facebook fan. TNS Digital Life. Will the real loyal shoppers please stand up? How to capture your holiday shoppers. The National Retail Federation reports that 51.8% of U.S. consumers will be doing their holiday shopping online this year, up 5% from 2011 and the first time the annual survey has shown online shoppers as the majority. The NRF based its findings on an early-October poll of approximately 9,000 consumers who plan to spend an average of $750 each on holiday goods and services. Furthermore, mobile devices will play a strong supporting role in the online shopping surge. According to the survey, 52.9% of smartphone owners and 64.1% of tablet owners will use their devices to do research and make purchases. Shop.org forecasts that online holiday spending alone this year will amount to a whopping $92 to $96 billion. Online word-of-mouth and recommendations from friends will no doubt make a big influence on consumer purchases and opt-ins into loyalty programs. Are you recognizing and rewarding your most influential customers? Social Loyalty is now the way to go for retaining and engaging customers in and outside of brick and mortar. Mark Fidelman recently wrote in Forbes online, the call for change have been happening for years; businesses that don’t move into the same venues where their customers spend the most time stand to lose out when it comes to opportunities to engage with and do business with them. Most businesses have heard all of this before: change now or fall behind. This upcoming holiday season, treat your influential customers well. Surprise and delight them with relevant/personalized rewards. Leverage their online influence to acquire new customers and drive purchase frequency or brand advocacy. Thank them for tweeting and sharing about your brand or products with their social network. Hey, you probably don’t even recognize which of your customers are already brand ambassadors. Don’t miss out on this opportunity! Would you like to learn more about social loyalty? Send us an email at info@meplease.com to get in touch with a MePlease rep today. About MePlease: MePlease invented social loyalty to monetize social media. 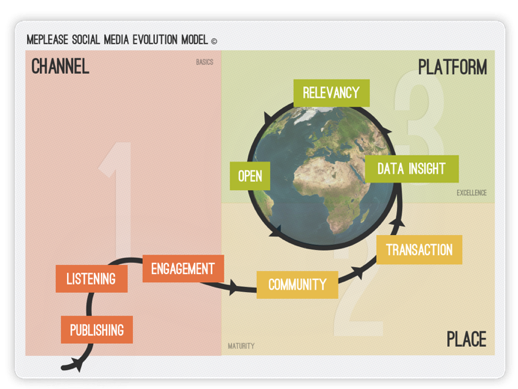 Our social loyalty platform grows and measures consumer engagement through social media, mobile and POS. It enables businesses to identify, track and reward consumers in new and delightful ways. At it’s heart, MePlease is about pleasing people by finding about more about what they like, what they buy, and who they share with so they can be rewarded in personal ways that inspire them to visit, spend and share more. Over at MePlease headquarters we’ve been even busier than usual by volunteering for Silicon Valley Comes to the UK. For those of you who are scratching their heads in confusion, SVC2UK is a not-for-profit, volunteer led series of events which are aimed at promoting business relationships between Silicon Valley and the UK and inspiring young people to recognise the value of entrepreneurship. Essentially, it celebrates something which is pretty near and dear to our hearts at MePlease so we just had to get involved! For a fresh-faced intern like me, volunteering at SVC2UK was an eye-opening experience. One day, we’d be heading to Parliament to interview some MPs, the next popping up to Cambridge to film some seriously impressive CEOs, and then getting ready for the Jobs Fair. It was certainly a hectic and whirlwind experience but one that was extremely gratifying. Amidst being star struck by the various entrepreneurs and furious typing of e-mails to other SVC2UK volunteers, as a volunteer it was sometimes easy to forget the real message of SVC2UK. That’s why, for me, assisting with one of the school talks that SVC2UK had organised was so inspiring. 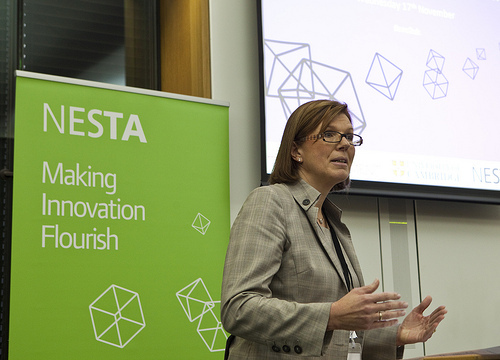 This particular talk was for sixth form students at an all-girls comprehensive in North London. There were four speakers in all: Ayah Bdeir, Sam Chaudhary, Alice Rathjen, and Joy Foster. Watching the reactions of the girls to their speeches which urged them to be creative, to work hard, and to never lose sight of their passion was really quite inspirational. They all seemed so engaged and excited about all these new possibilities that they hadn’t considered before. As a young woman myself, it was such a refreshing thing to see and I left that event proud of what everyone at SVC2UK had achieved already. The SVC2UK Jobs Fair in Cambridge was another event which the Meplease team attended, armed with an awesome PowerPoint presentation and our winning smiles. While, at first, running after complete strangers to tell them how amazing your company is can be a little daunting, I got the hang of it. I may have even have gotten a little too zealous about how much I love interning with MePlease… Some people looked slightly alarmed by the crazed intern raving about the incredible experience, lovely team, rewarding work, Russell’s delicious baked treats… Oops, I’m doing it again. Are you looking for a rewarding internship in social technology field? We welcome students or recent graduates to apply by sending us an email to jobs@meplease.com. Banks and Social Media; The New Age of Banking? The decline of Facebook’s value since its IPO in May of this year may be demonstrating Wall Street’s lack of faith in the social media giant’s future financial prospects; since opening at a price of $38 on the Nasdaq share prices have continued to tumble to levels half the original asking price. Despite this, the worlds’ banks appear to be more positive-minded about the social network’s power with regard to consumer and retail banking. The vast majority of retail banks now have their own Facebook page, Twitter account and Linkedin Groups as they strive to ‘connect’ with the customer in a more convenient and immediate manner. This is a continuation of the movement towards internet banking, but with a conscious effort to get back to being personal with the customer through ‘F-Commerce’- business carried out solely within Facebook. There appears to be a general movement demonstrating banks’ knowledge of the need to be on Facebook and Twitter, however research carried out by MePlease has revealed there are vast disparities among the progress and success that retail banks have made to date. MePlease has developed an index for measuring social media progress across the financial industry whilst also including some non-financials who are leading the social media charge. The index is compiled of 14 variables to produce two scores, demonstrating the firm’s social media reach (i.e. the potential audience that the firm can broadcast to) and their engagement (the extent to which their audience responds and interacts with the firm through social media). The ‘reach’ score is compiled using the number of Facebook fans, Twitter Followers, Linkedin group members and Facebook app users in a weighted scoring system using normalised data. It appears Amex and Citi are leading the way for the financial services companies, however they are still a long way behind global social media pioneers Starbucks and Burberry whose reach is several times greater than the best of the financiers. The engagement score is calculated using the same method of weighted, normalised data compiled this time from 11 variables including; average Facebook likes and comments per ‘brand post’, a variable to measure tweet sentiments, the response time of the firm to tweets and the number of interactions per fan among others. MePlease feels it is important to make the distinction between social media reach and engagement as they offer varying value to the firm and take very different levels of thought and dedication to grow. Reach is simply a measure of the size of the audience that the bank/firm has to broadcast its message. The larger the audience, the more chance of people hearing about or reading the great news the firm has to share. However, the true value of social media in a business sense is engagement with the consumers. A fan base of 500 where 80% of which actively engage with the firm through comments, likes, tweets and reshares is far more valuable than a fan base of 1,000 where only 20% ever engage. The first stage in the social media race is to grow one’s reach/presence as we mentioned previously. Social media is a new avenue for the traditionally conservative banking industry in this sense, yet it appears firms are keen not to let a rival enjoy a runaway success in the early stages. Amex appear to be gaining a foothold in the market with their ‘Link, Like, Love’ application which connects the user’s preferences and spending patterns to offer discounts on their Amex credit cards in applicable stores. 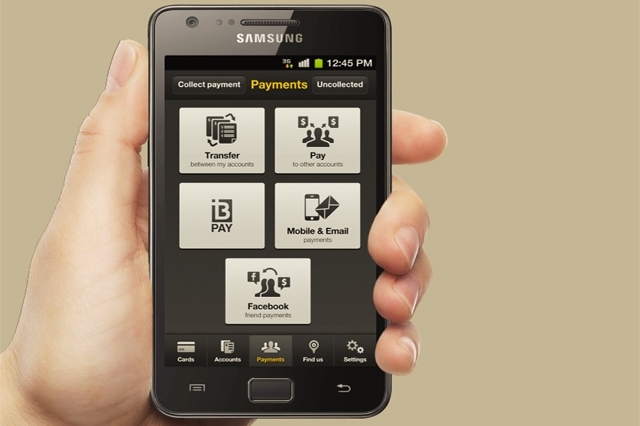 Meanwhile Australia’s Commonwealth Bank has gone a step further by introducing Facebook-integrated banking (“Kaching”) whereby customers can transfer money to friends/family entirely within Facebook. These examples appear to be the first (no doubt of many to come) to fully integrate banking services into social media. One should note the financial industry as a whole is a considerable distance behind other industries. Both Starbucks and Burberry are streets ahead in the social media race, with huge levels of engagement from their fans and even integration into mobile payment (in the case of Starbucks). Notably, the online fashion retailer Asos (its birth into online fashion was a beacon of adventure in itself) has integrated its sales business into social media where users can buy and sell their clothing all within a Facebook app. This will no doubt be the start of the race to social media superiority, using the best of the banks’ poker faces to play catch up with each other. What it may well also mean, is a price of $18 a share of a certain “FB:NSQ” will turn out to be a steal! MePlease is hiring an Android Software Engineer! MePlease is searching for an Android Software Engineer to join a small team working on the client piece of a large client/server system, an Android app with a complex UI that interacts with various peripherals and with a server side component in both online and offline modes. Starting as early as Monday 03 September, 2012 for a six month contract, with the possibility of permanent hiring after that. Berkeley or Mountain View. Transport shuttle to Mountain View available from various Bay Area locations. To apply, please send your resume and cover letter to jobs@meplease.com. Please state the position you are applying for within your application. If possible, please include a portfolio. MePlease is Social Loyalty. We are a fast growing start-up taking loyalty marketing to the next level through our mobile and social platform. Our mission is to treat people well. Based in Berkeley, US and in London, UK. our customers are many globally recognised brands. We are made up of world-class team members from great companies such as Google, Apple, Microsoft and Ofoto. Follow us on @me_please for updates. MePlease is hiring a Java Web Developer! MePlease is searching for a Java Web Developer superstar to work on a small team developing an administrative web portal for a complex client/server system. This admin panel will provide reports, data management, and other tools to administrators. Experience creating dashboard-type web applications in Java. Starting ASAP for a six month contract, with the possibility of permanent hiring after. This past week, Alisa Phanchalad wrote an article on Business2Community reminding Marketers that Social Media is a channel, not a strategy. The author emphasized that social media must be integrated with multiple marketing channels as part of a broader strategy. The author went on to say that the more channels you add, the more likely your strategy is to succeed and not fall over, similar to a table and its legs. Alisa has brought up many good points, but we would like to add to her story in order to paint a better picture of where we believe that the future of social media is headed. Adding more channels just for the sake of doing so will not necessarily increase the success of your marketing. The quality of the channel must be taken into consideration, especially when trying to engage and reach as many members of your target market as possible. Brands need to understand their target market’s media consumption behaviours. Are they 18-25 year-olds who spend hours socialising and shopping via their smartphones and no longer watch television? If so, then an above-the-line television campaign will do nothing to further your marketing efforts. A brand can spend thousands of dollars across multiple channels but may only see results from half of them if they are not carefully chosen. However, it is important to integrate your marketing communications for a synergistic effect. MePlease believes that social media is soon to be more than just a channel but a place. Unlike traditional media such as TV, Radio, and other ATL, consumers are spending many hours of their lives “living” online on social media platforms and performing a lot of their activities on them as well. Consumers are continually sharing as they shop, research, listen to music, watch movies, and socialize. AMEX has leveraged the fact that many of their customers live on social media by introducing AMEX Sync (Amex Go Social and Link>Like>Love), thereby rewarding customers for their online social behaviour and providing value for merchants. We also really like Shopycat as an example of a social place. It analyzes your Facebook friends’ likes and dislikes and recommends gifts for you to purchase through Wal-Mart’s app on Facebook. The next evolution we foresee is that social media will become a platform where many relationships are initiated and continue to be built off of one another. A great example would be the partnership between Foursquare and Amex. 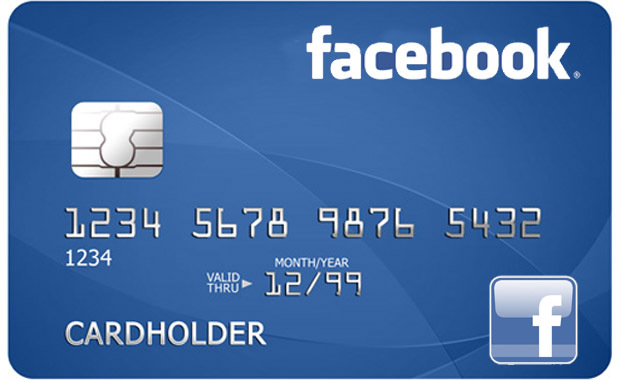 In recent news, Facebook has talked about offering a bank service, or at least providing banking facilities for customers, and because brands are able to set up online shops right on their own Facebook Pages, these online transactions could be easier than ever. When coupled with the fact that Facebook now provides all users with an @facebook.com email address in addition to their current platform for socializing, gaming, and sharing, Facebook is poised to become a one-stop-shop for all of its users’ online needs. First, brands need to learn that social media is no longer a one-way publishing street, but a place where brands and customers engage and learn about each other. What do you think readers? Do you have any examples of social media evolving to become places and platforms? Do you agree or disagree? Leave your comments below!